Superstar Mahesh Babu is back with a bang to shatter all the existing records of Telugu cinema. 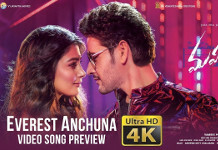 On the eve of Ugadi, the teaser of his next film Maharshi has been out and it shattered all the existing records of Tollywood. The teaser clocked 10 million views on YouTube alone in less than 12 hours which is a new record. Earlier, Mahesh Babu’s Bharat Ane Nenu teaser clocked 9.1 million views in 24 hours and Maharshi crossed it by miles in just 12 hours. Now teaser clocked 16 million views on YouTube. Superstar fans who are eager to witness the glimpses of Maharshi have been left thrilled with the macho presence and variations of Superstar in the teaser. It appealed to all the sections of the audience and kept trending across all the social media platforms. The teaser trashed all the records of Telugu cinema in just 12 hours. Mahesh promised to offer a commercial treat with Maharshi which is slated for May 9th release. According to the latest reports, the entire overseas rights of Mahesh Babu’s Maharshi were sold for 13.5 crores. Great India films have acquired the distribution rights of this film for the overseas market.